Why is electric bike insurance important? We know how precious your electric bike can be to you. More than any other bike you have ever owned, you will love riding it. For work, college and leisure; up hill and down dale. Day after day it prove it’s worth. Your electric bike is a resource worth taking care of and that is why we recommend electric bike insurance from Lexmark. Their insurance is designed to cover you against the events which could affect you the most, giving you peace of mind. 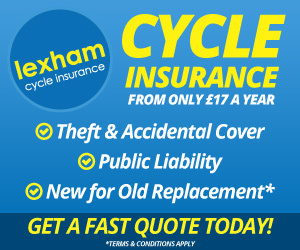 Importantly, third party cover is included automatically, and there is a 10% discount for fitting an Immobitag to your bike at the time of purchace. Get an instant online quote by clicking on the Lexmark logo on the left or above. The application process is online, and is quick and easy to follow. Simply choose the value of your bike and your quote appears on the right hand side. This great value quote covers you for all the cover shown below. As you proceed through the options you can clearly see how it affects your quote, and whether to take the option. At the end and few quick details about you and your bike, and a direct debit form if you want to pay in easy monthly installments over the year. And if you are not sure about anything there is a telephone helpline who are happy to guide you through.